Student delegates strategize for their countries. Webster's Model UN integrates the expertise of three academic departments (International Relations, Media and Business). 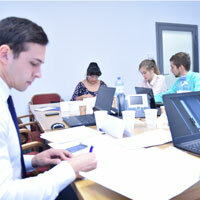 The annual Model United Nations conference at the Vienna campus kicked off Oct. 17 and concludes Monday, Oct. 20. This year’s theme, "Geopolitics of Resource Scarcity," brought over 100 delegates to the Palais Wenkheim in Vienna. Designed as a simulation in which students learn about diplomacy, international relations and international organizations, the conference gives delegates a first-hand opportunity to experience how it would be to work in international affairs. After an introduction by Julian Schuster, Webster's provost, senior vice president and chief operating officer, the opening ceremony keynote speech was given by Ambassador Hubert Heiss of the Austrian Ministry for European and Foreign Affairs. He discussed the evolution of Austria’s energy policies in an international context. Franco Algieri, department head of International Relations at Webster Vienna, highlighted the fact that the annual conference is able to integrate the expertise of three of Webster’s academic departments (International Relations, Media and Business) in an exemplary manner. Students and faculty in each area collaborate to to create an immersive learning experience for students. Learn more about the Model UN in the full story at Webster Vienna and at the conference website, webmun.org.